Students will be able to develop sequenced pieces of creative writing. Tell students that this lesson will involve writing an adventure story about a random object. Write on the board: The adventure story must be told from the point of view of the object or from the point of view of the object's owner. Choose one of the small objects, and create a writing sample for it on the board. Write five sentences: the exposition (introduction explaining the story's background), rising action, climax (main problem), falling action, and resolution (ending that includes a solution to the main problem). Ask students for suggestions of what will happen next. 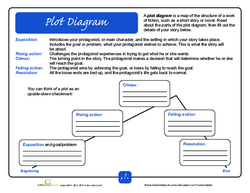 Hand out copies of the Plot Diagram worksheet. Review how each story component is supposed to function. Have each student choose a small object. Ask each student to fill in his worksheet with an outline for a story about his object. As students work, use a document camera to display a sample worksheet. Fill it in, and allow students to watch you if they find themselves struggling. Once you complete your sheet, check in with struggling students and provide assistance if needed. 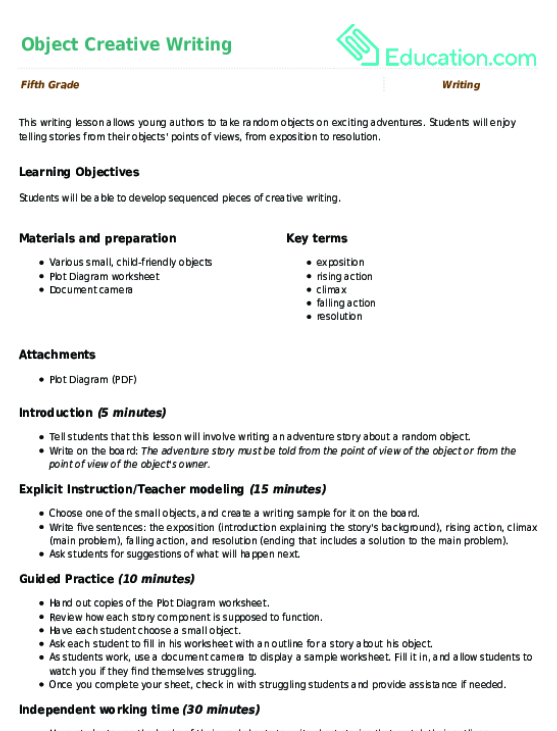 Have students use the backs of their worksheets to write short stories that match their outlines. Enrichment:Have advanced students focus on using exciting vocabulary. Ask that they each use at least 10 descriptive verbs. Support:Give each struggling student a starter sentence for his story. You can also help students fill in their worksheets. Inspect students' work over the course of the lesson. Have students share their writing samples with the class using the document camera. Assess each student's comprehension of the lesson based on the quality of his sample. Review the definitions of each story component. Your little writer will use his imagination to bend time and space with this creative writing prompt. Where will he go and what will he see?